Sometimes you can dramatically alter your photo composition just changing your perspective. This quick guide to using camera angles more effectively will help you take pictures you can be proud of. Below we'll show you 5 simple techniques you can use to alter your camera angles for dramatic effect. The search for a new angle in photography is a never-ending challenge. Showing everyone how we see the world around us from our own perspective is often the driving force for photographers. Unusual and quirky angles are the mainstay of images with impact. We'll show you how to get past the usual 'record' shot and compose a picture with instant wow factor. 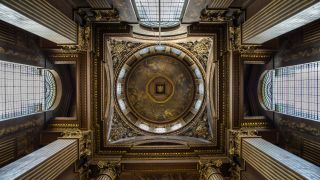 It's all too easy to wonder round with your camera without bothering to look up, but try and make the effort to do so as you can be rewarded with some striking compositional possibilities that can have bags of impact. This approach offers a 'worm's eye view' of the world and works extremely well with wide-angle lenses. Spend time looking for the 'perfect' perspective and if you find a reasonably symmetrical pattern, such as here, then keep it central. If it's just a hole in the canopy of a forest, try placing it according to the rule of thirds. This is where tilt-angle or vari-angle screens come into their own. This shot was taken with the camera low to the ground, with framing of the image done via the rear screen with the camera in Live View mode. For some shots you'll want to get down even lower, but for successful shots like this, try and include some of the foreground interest - here the long shadow cast by the pillar draws the eye in, as this will add a real sense of depth. Try and avoid distraction backgrounds as well for a strong compositional image. Taking shots of some subjects straight on so the horizon is level can be technically correct, but can mean the resulting image can lack drama, with lots of dead space below and above your subject. By twisting your camera (or by cropping the image at a later date in Photoshop or similar), it can create a strong diagonal line through the frame and is ideal for a pleasing, unusual composition that gives instant impact to most pictures. Be mindful of the subject though - obviously a landscape, where a level horizon is critical to the success of the shot isn't suited to this technique, but there are a range of other subjects that twisting the camera can really add drama to the shot, from portraits to car. We've all seen pictures of famous places and landmarks. Usually they're taken as a 'record' shot and rarely differ from photographer to photographer. Why not stand out from the crowd and do something special? Composing to include and accentuate a well-known feature of your location is always worth a try. In this image of The Old Royal Naval College in London, UK, a wide-angle lens has been used to emphasise the two identical buildings, and the symmetry they create. While it's normally a good idea to try and get architectural images as upright and as straight as possible, the exaggerated angle enhances the shot in this instance. This angle is full of impact and is a powerful compositional tool. Everyone takes pictures from head height. Make your photos stand out from the crowd by raising your camera up high or finding a higher vantage point. Weather you raise the camera above your head and rely on the rear screen to frame and focus your shot or find a raised position from which to shoot, this approach can produce some really interesting results. It's also much easier to keep the background clean and free from clutter as well, which is important for a shot from this angle to work.